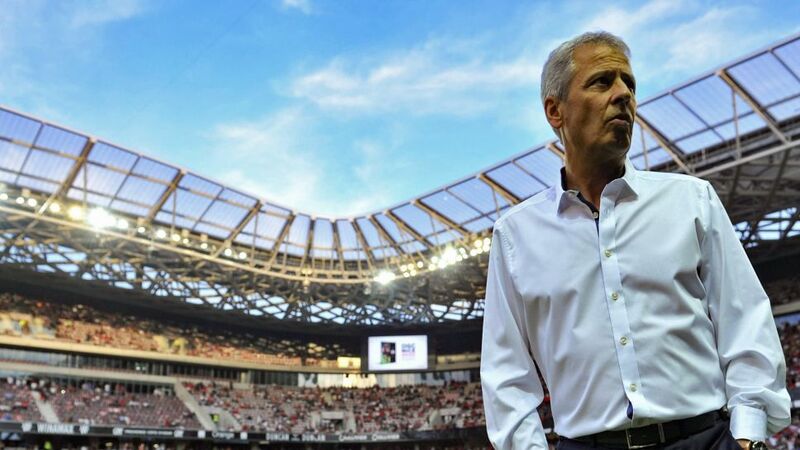 Borussia Dortmund have acquired one of European football's most innovative coaches in Lucien Favre, but how did the former Hertha Berlin, Borussia Mönchengladbach and Nice boss end up in the dugout? Who inspires him? And what makes him tick? "It was 1991 - I was 34 and had already thought about what I was going to do once I stopped playing. First I coached youth teams – straightaway I knew it was for me. That was decisive to my next career step. After that, I took charge of a third-division team and so on. When you’re 32, 33, it’s very important to think about your future, otherwise it will be difficult. Nowadays a playing career lasts roughly 10 years and everything goes quicker, which is why it’s so important to prepare for the future to make sure you don’t miss the boat. As a player, if you’re only focused on your playing career and not thinking about your future, it makes it difficult. That’s a piece of advice I’d give to all players." "I think it’s great that those responsible at Hoffenheim were so brave, but as a coach you have to deliver good results in the medium- and long term, not just over six months. Julian Nagelsmann has done a fantastic job at Hoffenheim. He’s been a breath of fresh air in the Bundesliga. It’s a pleasant surprise to see so many young coaches in the Bundesliga, it’s good for football." "Johan Cruyff, as a player and then as coach at Barcelona. I also really rate coaches like Arsene Wenger and Christian Gourcuff. We get on well. When I was a youth coach, I used my free time to sit in on all manner of coaches: Wenger’s early years at Arsenal; Raymond Goethels in Belgium; Ottmar Hitzfeld at Bayern Munich and, most notably, Cruyff at Barcelona in 1993. I was there for two weeks, but I’d already observed his work, how he let Barca play, the mobility of his team - with and without the ball - the anticipation and so on. Tele Santana also impressed me when he was in charge of Brazil. He was fantastic." "Pep is the logical successor to Johan Cruyff. He was Barca’s midfield strategist in 1993. He was very intelligent. Players that are that intelligent have a good chance of becoming good coaches. I can remember the first hour of the Champions League last 16 first leg between Juventus and Bayern in 2016. Juve hardly saw the ball because Bayern pressed so hard. Guardiola also changed his system during the game. He’s one of the best coaches around." "To play at high tempo, you first have to have a certain degree of football intelligence. Then it’s about technique. In order to meet the demands, you also have to be in top condition. In my opinion there’s the most room for improvement in the teaching of the technical aspect. I find that not enough good work is being done in that area at a lot of clubs. For example, not every player can control the ball at maximum speed and then immediately play a long, pin-point pass up field. If you master that, the opponent will be overwhelmed. That’s how you can make the game better and faster. I really like it when you surprise the opposition with a quick forward pass. A modern player should be two-footed, too. Technique is definitely the area that needs the most work. There’s still a real need for improvement on that front." "Good dribbling can make the difference. Just look at Arjen Robben or Franck Ribery. They have it down to a tee, whether it’s a one-on-one or one-on-two situation. These kind of players are incredibly important because without them the game would be boring. I like possession, but not possession for possession’s sake. There’s nothing spectacular about just passing the ball. That’s why there needs to be more emphasis on dribbling at grassroots level. A player who can take two players out by dribbling and then play a killer pass - that’s the meaning of collective. For me, it’s important to have players in the ranks who can dribble because they can make the difference every time. To make the difference only by playing passes is almost impossible."